Within Ontario, electrically-heated domestic hot water (DHW) tanks are commonly used in jurisdictions or buildings not serviced by the natural gas distribution network. The efficiency of electrically-heated DHW tanks is described by an Energy Factor (EF) rating, which quantifies the energy contained in the hot water produced by a tank as a fraction of its electrical energy consumption. If a tank was able to convert all of its electrical energy consumption into useful hot water then it would have an EF of 1.0. This would represent the highest possible efficiency for a DHW tank of this type. Actual tanks have a slightly lower EF due to losses related to recovery efficiency, cycling and standby operation. An alternative approach to heating water with electricity is an air-source heat pump water heater (ASHPWH), which may be greater than two times more efficient than the conventional approach. 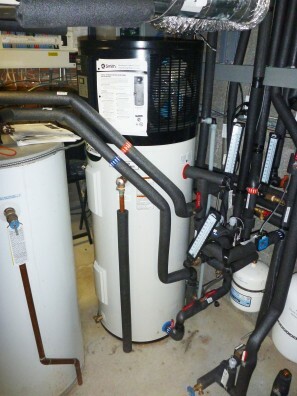 The large efficiency improvements are possible because of the heat pump technology within an ASHPWH that is able to move (or “pump”) heat energy from ambient areas outside of the tank to the water within the tank. If heat energy is pumped from the ambient indoor air then the ASHPWH will also actively cool and dehumidify the space. This is beneficial in a warm climate; the ASHPWH is a single appliance that heats water, air-conditions and dehumidifies, while consuming much less energy than would be required to do each independently. It is for this reason that ASHPWHs have seen wider deployment in the southern U.S. and southern Europe. However, the uptake in cold climates is much lower. Residential buildings in Ontario may have both a large heating load and a large cooling load. In this application, the cooling season benefits may not always outweigh the heating season drawbacks since the ASHPWH would increase the building heating load. STEP has teamed up with the Ryerson University Mechanical Engineering Department and A.O. Smith (an ASHPWH manufacturer) to evaluate the performance of an ASHPWH, currently installed at the Archetype Sustainable House, in an attempt to identify potential benefits of the technology for a Canadian context. The experimental component of this research focuses on the ASHPWH performance given a realistic simulated draw profile and different operating points of ambient temperature and relative humidity. A theoretical component will then use the experimental data to calibrate a TRNSYS model useful for analyzing the performance in a number of potential applications.